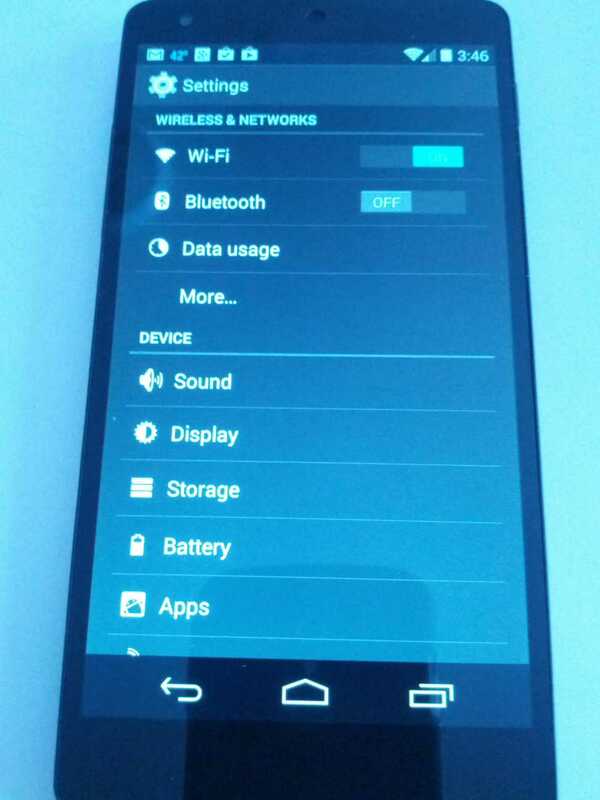 These are some tips for android absolute beginners. Basic android tasks, like swiping, setting up icons, etc. A lot of the time tutorials, etc, tend to skip over steps. For a real beginner that can be frustrating and worrying. With digital cameras, pictures are cheap, so I've tried to photograph the steps exhaustively. There are several basic user interface concepts you need to know. I list them here. This list has gotten a bit long, but I assure you, if you scroll down, there's a bunch of photos later on :-). The screen you see when you first unlock your phone. Analogous to your computer's desktop, which is analogous to a real desktop, i.e. the place where you do most of your work. 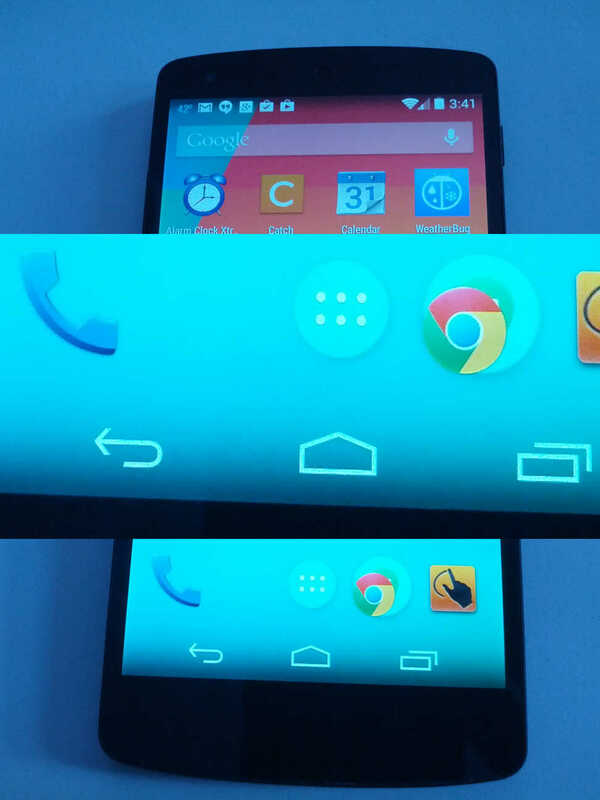 You have three home screens to start, the center home screen and one to the left and the right. You can add more, just by dragging an icon past the edge of the left-most or right-most home screen. After 30 seconds of inactivity, your screen goes blank. 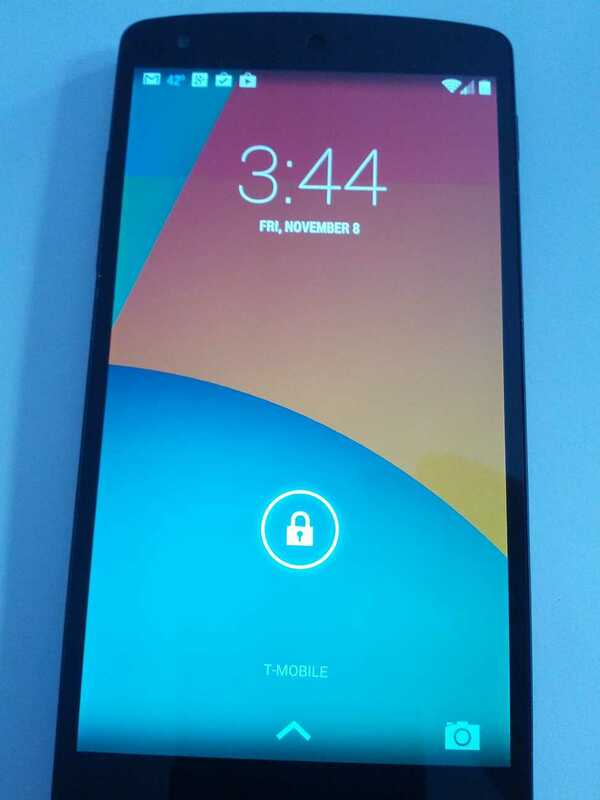 If you press the power button, it lights up, but now you see the lock screen. This is to prevent you from accidentally running apps or making phone calls if the power button gets pressed by accident. You can also change the lock screen setting to add some privacy and security, by requiring the user to draw a pattern before it will unlock. More on that later. 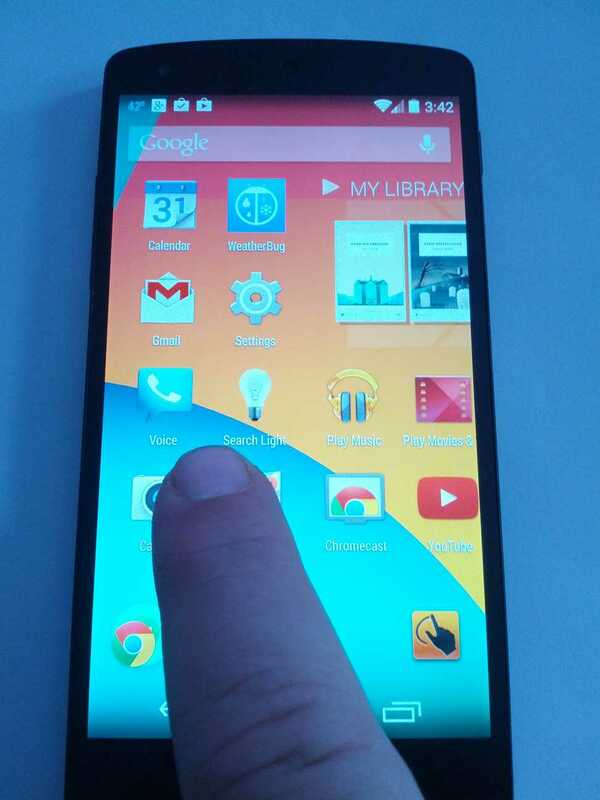 Touch the screen with your finger; you may find that gloves or other non-conductive materials interfere with this. 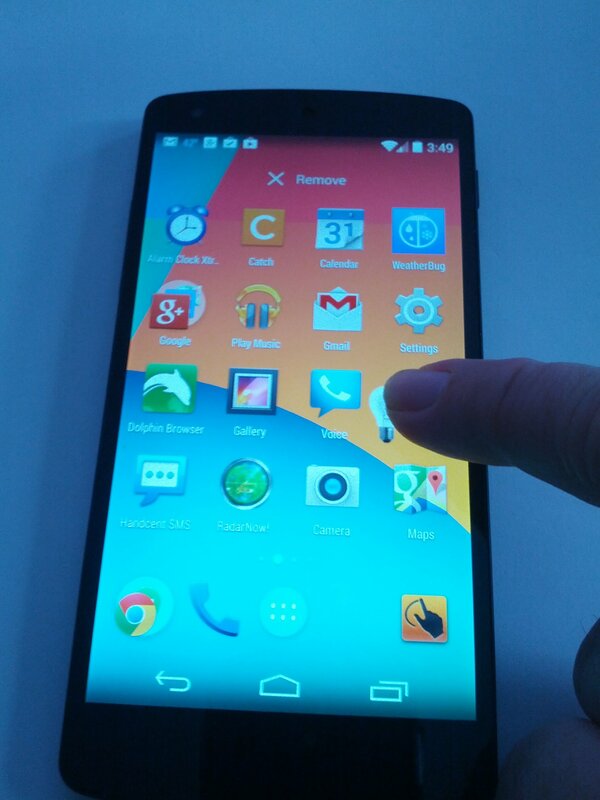 Touch the screen (often a button or icon on the screen) with your finger and keep your fingertip pressed against the screen for a second or so, until something happens (usually you use press-and-hold to get a menu to pop up). 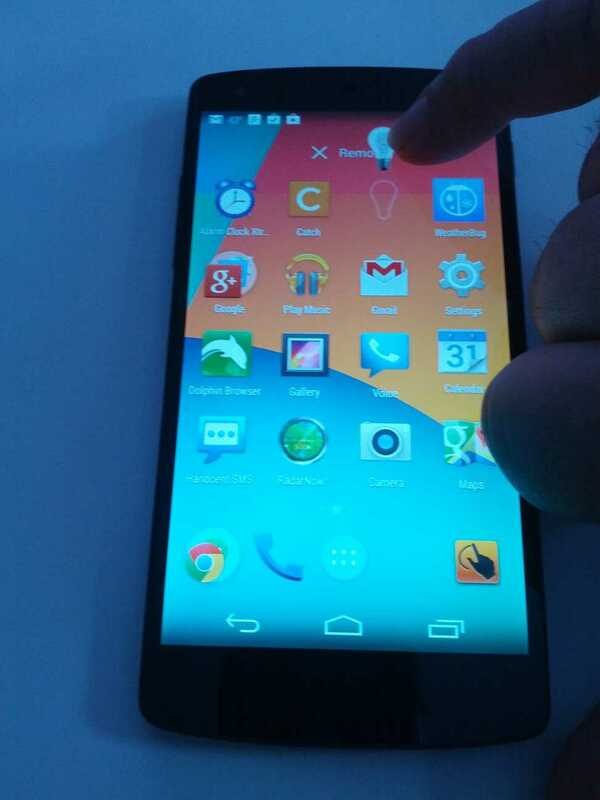 Touch the screen with your finger and then move your fingertip without lifting it away from the screen. 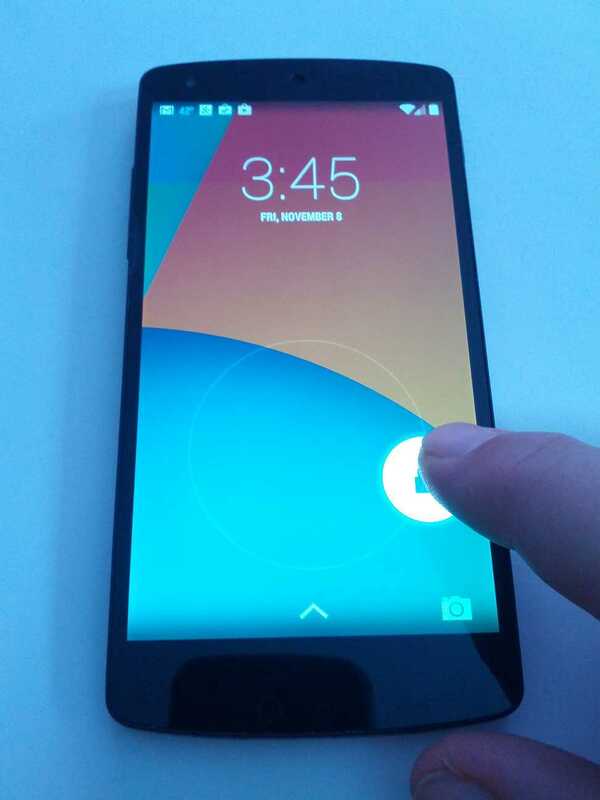 Touch the screen near an edge and drag your fingertip towards the opposite edge. Row of tiny icons at the top of your screen that displays pending notifications and things like battery status, signal strength, etc. 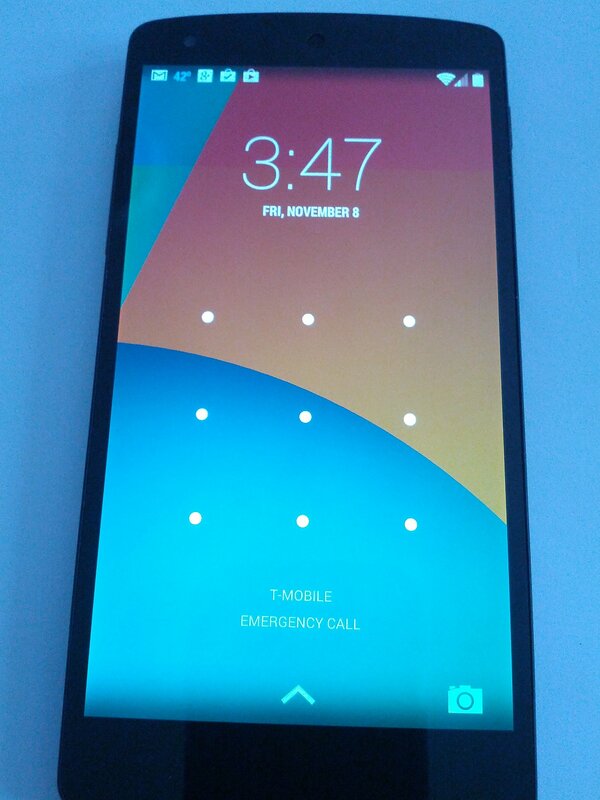 Swipe down from the Status bar to show the notifications in detail. Tap an individual notification to see even more detail; sometimes it launches the associated app. Google search dialog near the top of the screen, just below the Notification Bar. You can invoke the google search by saying (while at the home screen), "OK Google" followed by the search query, for example saying "OK Google, what is the circumfrence of the earth?" Icons that don't launch an app, but rather do something while remaining at the home screen. They're kind of like applets. A set of buttons at the bottom of the Home Screen, that shows up almost everywhere, every home screen and usually in apps. From left to right, the Back button, the Home button, the Recent Favorites button. 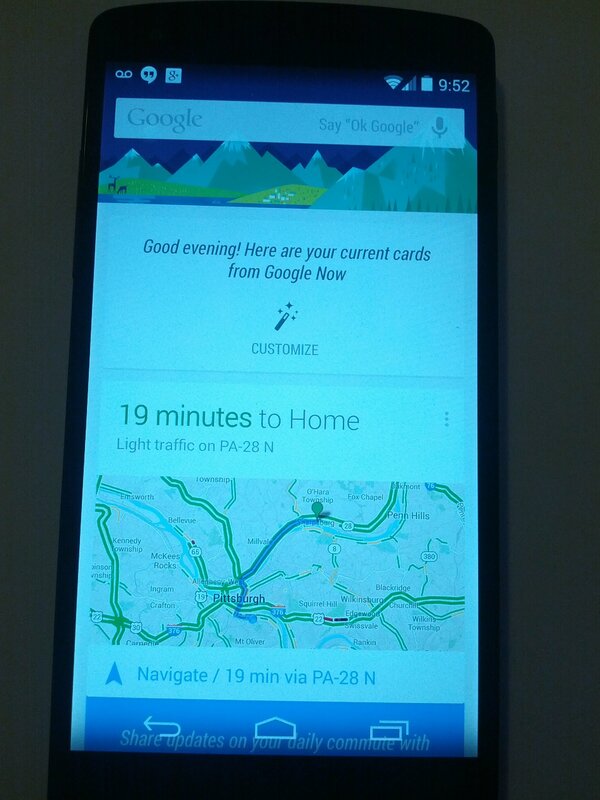 A set of icons at the bottom of the screen, just above the Navigation Bar, that remain the same on every home screen. The top row has four spaces for shortcut icons, which default to the Phone dialer app, Google Hangouts (combined cellular text messaging and instant messaging), Chrome web browser, and the Camera. The center icon is not customizable, it's the All Apps icon (used to be called App Drawer). 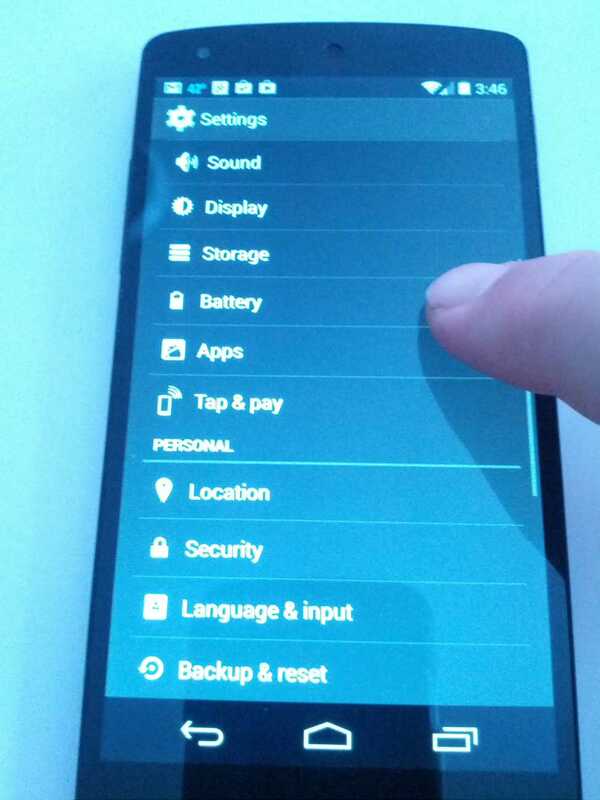 The generic back button, looks like a an arrow pointing left. Takes you back to whatever screen you were on before this one. If you're on the first screen in an app, the back button exits the app. Depending on what the app developer did, it may prompt you before exiting. Again, depending on the developer's choices, exiting may close the app, or it may leave the app running. If it leaves it running, you can switch back to it with the Recent Favorites button, or you can simply use the app's shortcut icon again. One of the row of bottom buttons, shaped like a house (i.e. a square with a triangular roof). Takes you out of whatever app and back to the last home screen you were on. This used to be on the standard visible-everywhere button set, often as a small square with several lines in it. Newer versions of Android (since Honeycomb, 3.0) put it in the individual apps, usually the upper-right corner, a vertical line of three dots, as part of the ActionBar (a standard Google UI component, a bar of buttons across the top, just below the Notification Bar). A small icon shaped like a stylized microphone, it lets you use voice recognition instead of typing something with the keyboard. If it's there and where it is depend on the individual app. 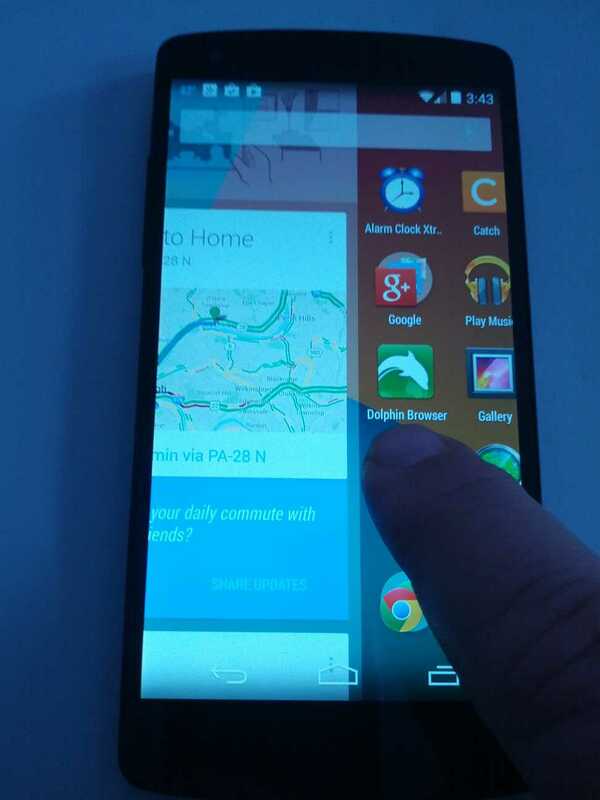 There's one on the google search bar on your home screen. If you're using the keyboard, there's a microphone icon near the bottom left. 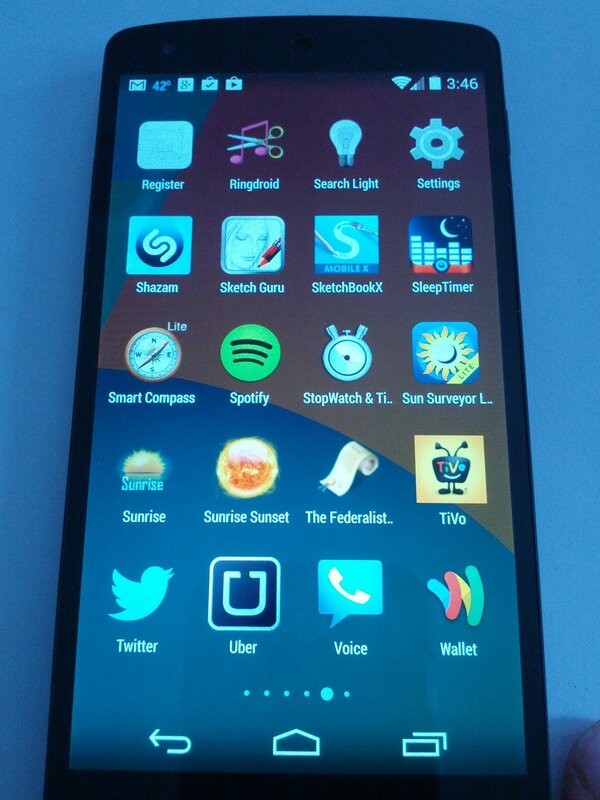 Lists ALL of the apps installed on your phone. Generally it's best to make shortcut icons on your home screen, for the apps you use frequently. Note, All Apps also has the Settings app, which is important because it lets you manage all of your settings. I usually make a shortcut icon for that. 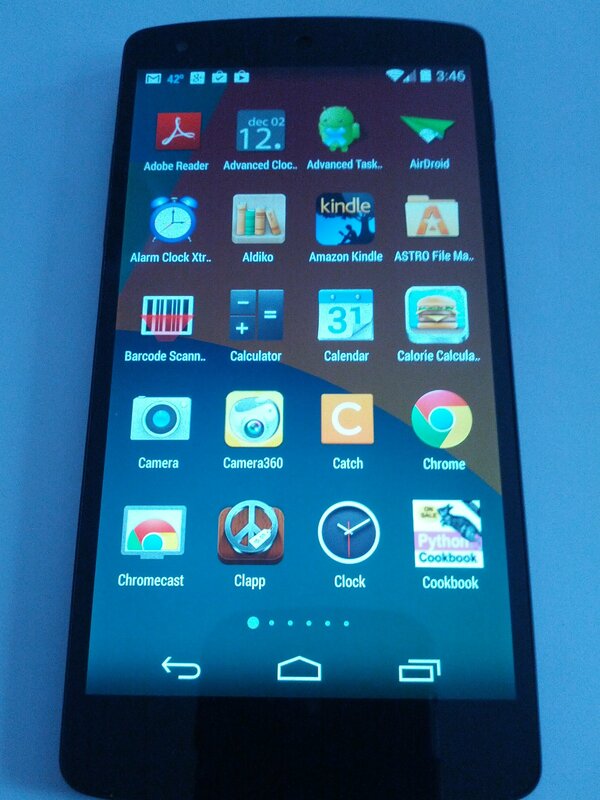 Launcher is the android term for the app that actually provides the home screen interface. 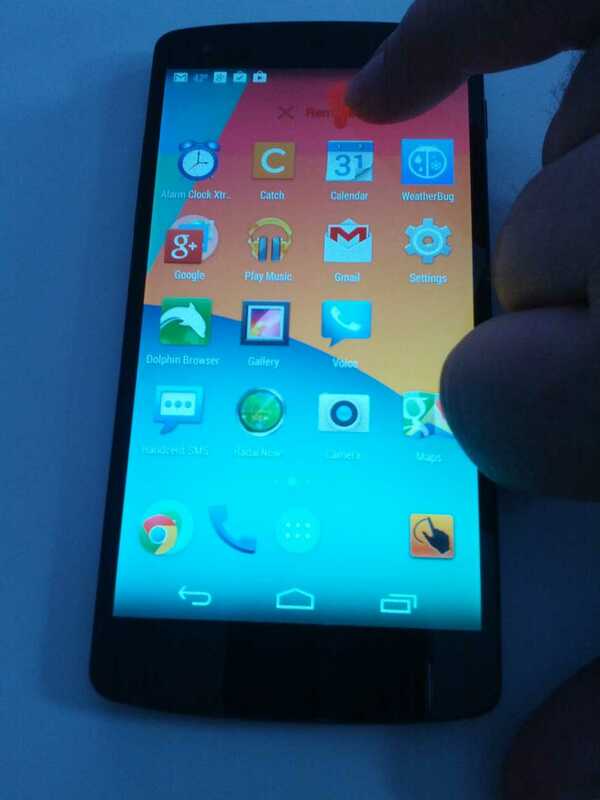 You can replace the default launcher with another launcher app, but this is advanced android stuff. 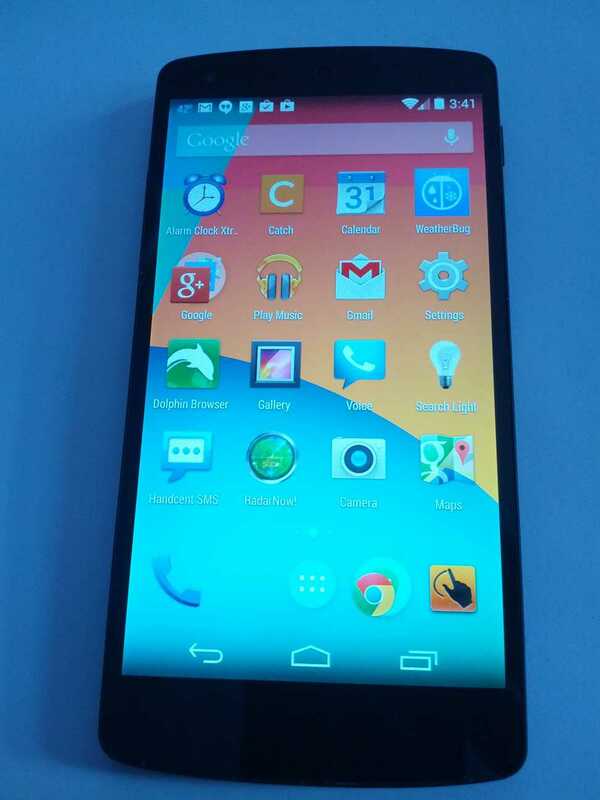 Most proprietary android phones (i.e. 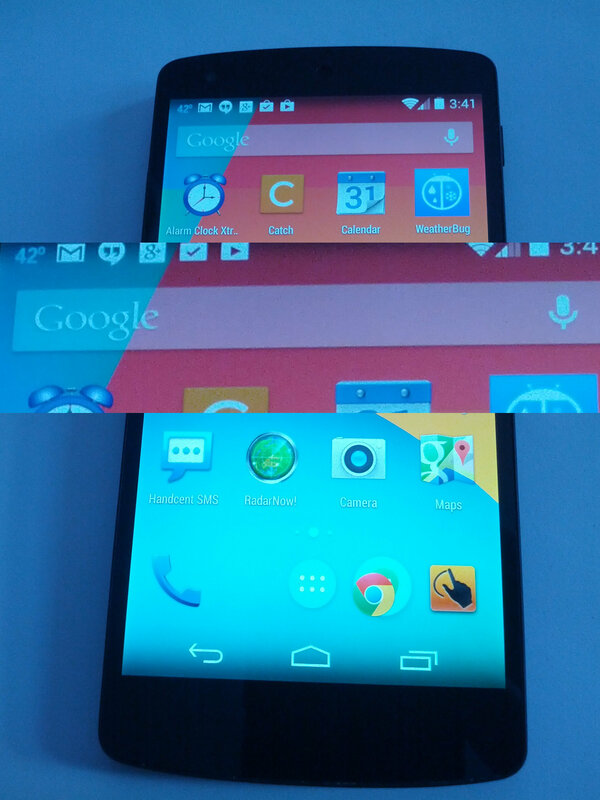 non-nexus phones) have customized launchers that the phone vendor or cellular provider put on them. 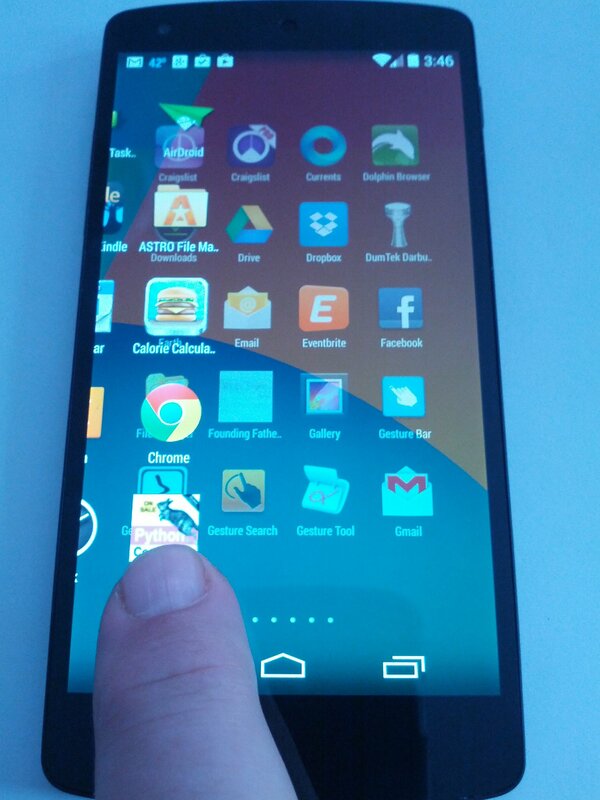 The Play Store, aka Google Play, is where you get your apps from. It's not the only way to get apps, but using alternatives is a somewhat more advanced topic (it's not rocket science, but not today). 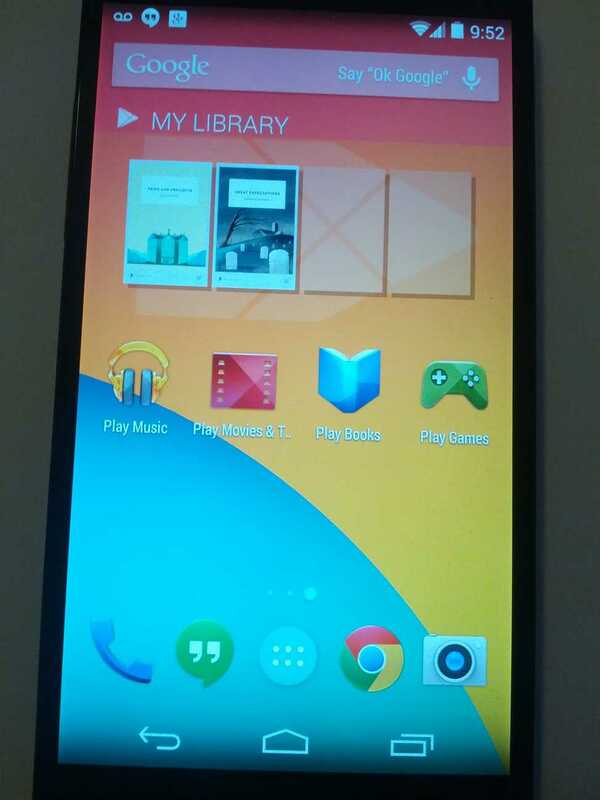 One possibly-confusing bit, the Play Store is also where you can get movies, ebooks, music, etc, not just apps. The Play store is in the All Apps, under "Play". This is a gesture that's not always available; it depends on which app you're in. I use it most often in the Chrome Web Browser. Put two fingertips (usually your forefinger and thumb) on the screen and then either move them apart to zoom in (make the content larger) or move them together to zoom out (make the content smaller - usually only possible after you've zoomed in). If you tap in an input area (for example, the Google Search bar) a keyboard will appear at the bottom of the screen. More on this below. This photo is from just after I unboxed the nexus 5 and set it up (see the link at the top for those photos). There aren't a lot of icons on the home screen yet. They're all hidden in the All Apps right now. I'll show you the All Apps and how to put icons on your home screen later. The lock screen is to decrease the chances of pocket-dialing, although you'll see that at the bottom are the words "Emergency Call". If you tap those words, it'll bring up the dialer, but will only allow you to make 911 calls. This is legally required of all cell phones in the US, but it does lead to some nerve-wracking moments when you pull your phone out of your pocket and see a partially dialed 911 call... so far I haven't actually dialed 911 by accident. You get to these screens by "swiping", touching your finger to the screen near one edge and then dragging over towards the other edge. You can swipe left, right, down and up. I'll show you "swipe left" and "wipe right" here. I'll show you "swipe down" when I show you the Notification Drawer, below. "Swipe up" is mostly used to scroll in apps, I'll show you that when we scroll through the Settings, at the end of this page, where we change the lock screen. 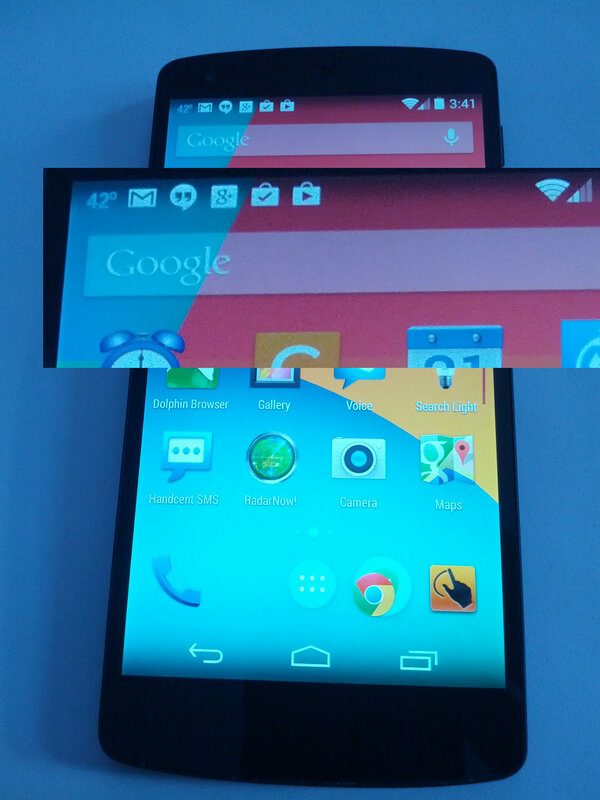 Here's a zoom-in on the Notification Bar at the top edge of the screen. You can see several tiny icons. I'll explain those icons in a bit. Here's a zoom-in on the search bar, just under the Notification Bar. 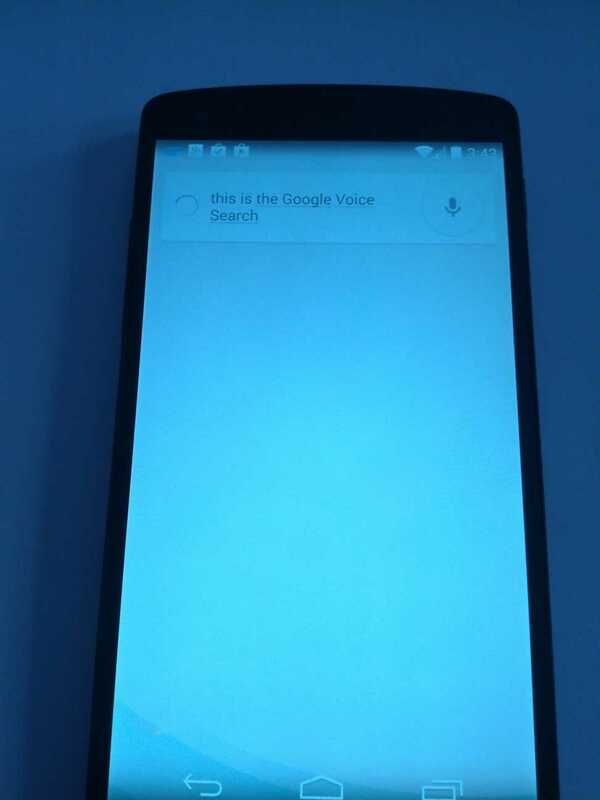 This is also used for Google Voice Search, which I'll explain down below. Also note the row of icons above the menu bar. This row of 5 icons is repeated on every home screen. 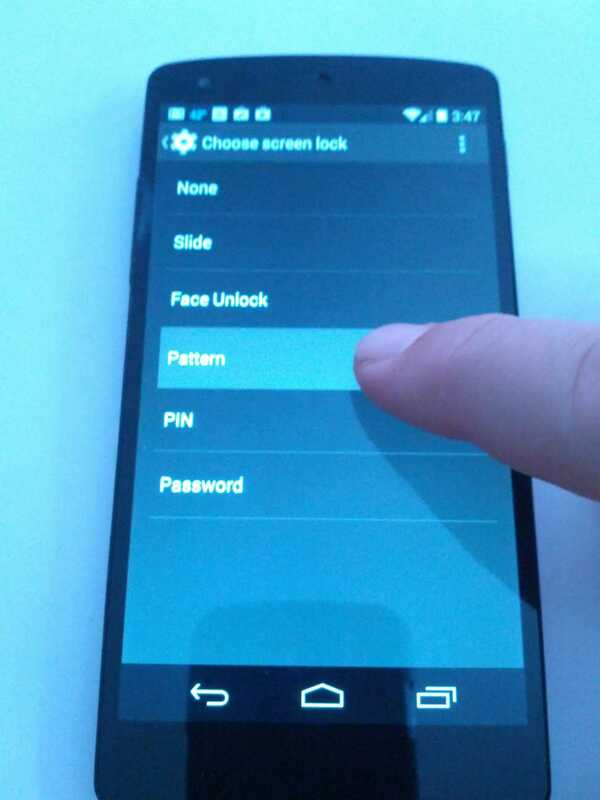 By default it starts out with icon for your Phone dialer, Google Hangout, All Apps, Chrome web browser, and your Camera. The All Apps is the most important of these 5 icons, it's the center icon, a circle with two rows of three dots. I'll get to that a bit further down. Here we are, back at the Notification Bar zoom-in. The first tiny icon displays "42", the current outdoor temperature in my location. The second, "M" icon, means I have new Gmail messages. The third, a stylized double-quote in a cartoon word balloon, is the icon for Google Hangouts, which in Android KitKat is the default integrated chat client for cellular text messages (aka SMS) as well as Instant Messaging (via Google+ Hangouts, formerly known Google Talk). 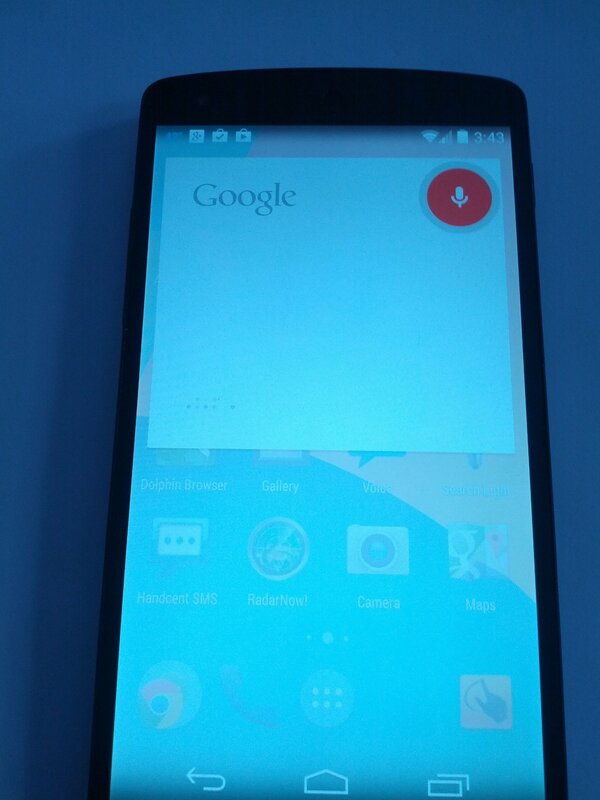 The fourth, "g+" icon, means new notifications from Google+. The two little shopping bag icons are from Google Play, indicating both some updates to my apps and some other Google Play notifications, probably that it completed some app installs that I started earlier. 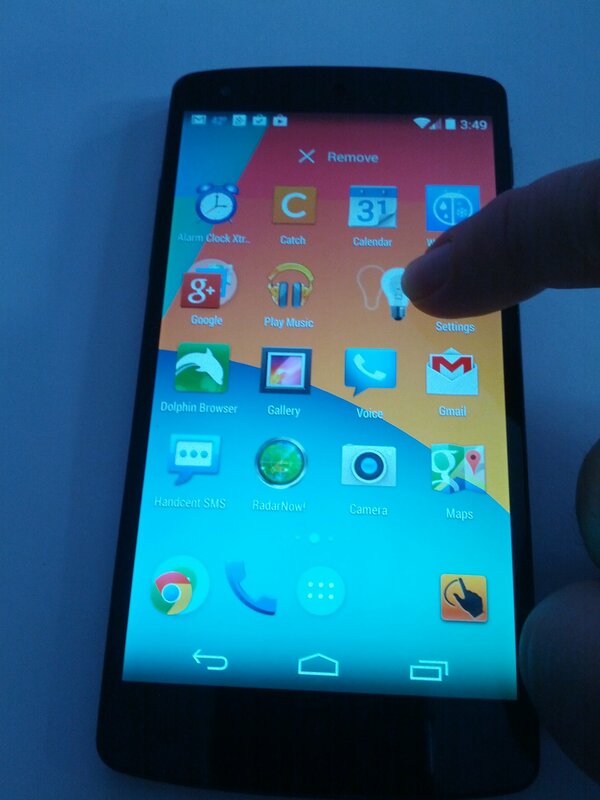 "Swipe down" means to touch near the top edge of the screen and drag down. 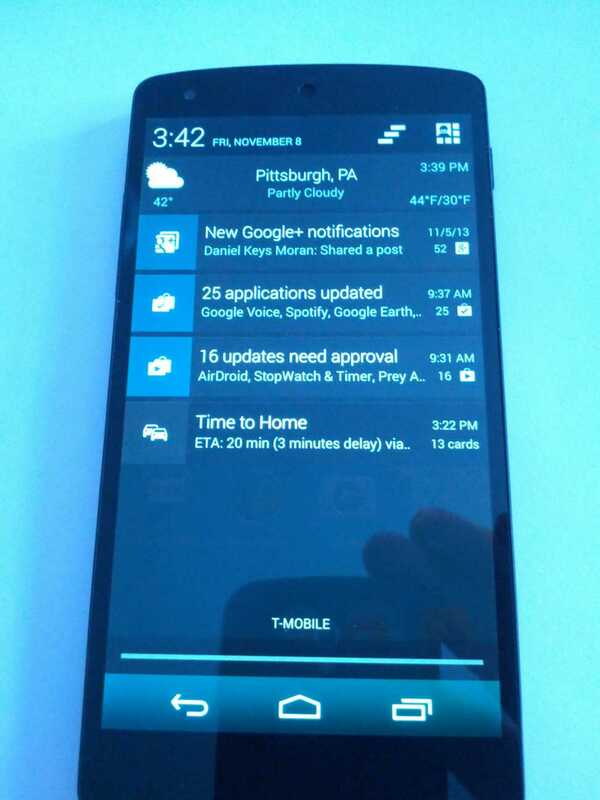 This displays your Notification Drawer. Note that before I took this photo, I checked my email and messages, because I didn't want to display them to the whole world. I left in the Google+ notification from Daniel Keys Moran, because he's an awesome writer and I'm happy to display that to the whole world :-). To display details about each notification, just tape the notification line. In some cases, for example the Google+ notification, this will cause android to start up an app to display the info. 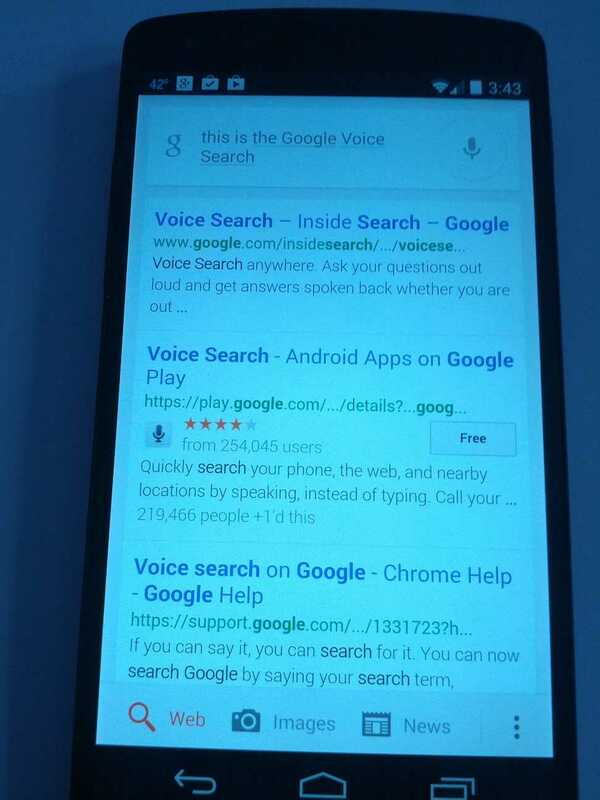 Google has had voice search since a long time before Apple started offering Siri on the iphone. 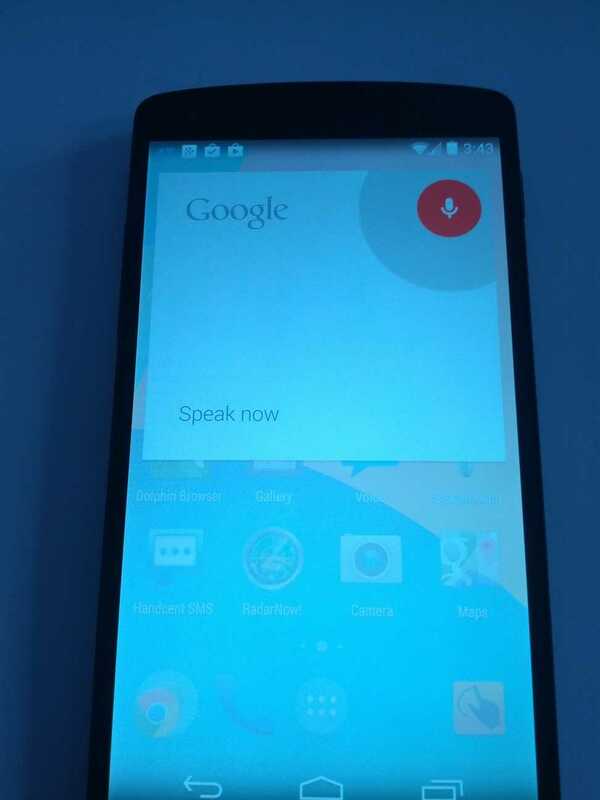 One of the new features in KitKat is that you can now use "hands free" voice search, i.e. without bothering to tape the microphone icon. 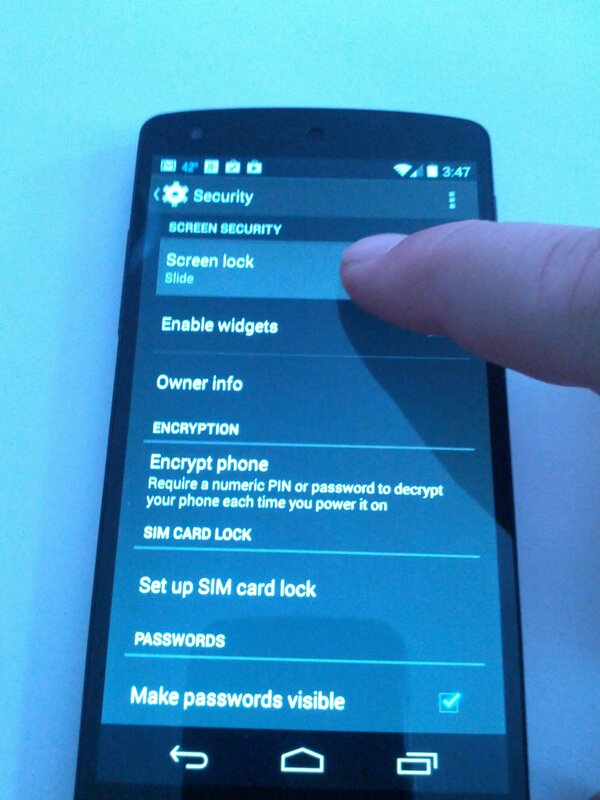 This only works when you're at the home screen, not if you're in an app or the phone screen is locked or dark. Just say "Okay Google, this is the google voice search". First the google voice search screen pops up, saying "Speak now". In my experience it's fast enough that you can just say the whole sentence and voice search will keep up. Now it displays "..." to show it's thinking. It has to use google's servers to do this, so if you're somewhere without network signal, it won't work. And a couple seconds later, here are the results. You can see at the bottom there's a bar of icons to choose what kind of search, just like the google home page. It defaults to Web, but you can choose Images, News, Shopping, Videos, Blogs, Discussions, Books, Applications (to search in the Google Play store) or Phone (to search your phone). You have to tap one of the search results to see more. If the voice recognition got it wrong, or you change your mind, you can tap the search bar to go into keyboard editing mode, or tap the icon to re-do the voice query, or just say "Okay Google" again. You can rearrange the 2 icons on either side, just like you can rearrange other icons on the home screen. But you can't change the center icon, the circle with two rows of three dots. That's the icon to open the All Apps, where all of your apps are stored. You can make a home screen shortcut for any app in the All Apps. Press and hold down on an icon in the All Apps. After a moment, the home screen appears. 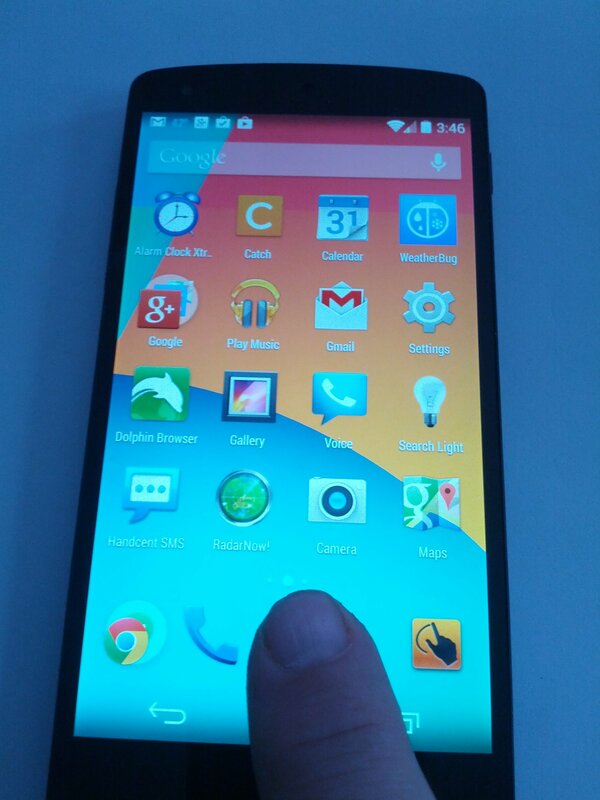 Move your fingertip to where you want the icon to be, then lift your fingertip up. It'll be the same home screen you were on when you opened the App Drawer. You can drag the icon over to the left or right edge and hold it there for a second, and it will switch to the next home screen. You can move icons around later, just press-and-hold the icon until the screen changes, and then drag the icon to where you want it to go, and lift your finger to leg to. If you drag the icon partly over another icon, the other icon will be shifted to the next empty space, to make room for the icon you're dragging. 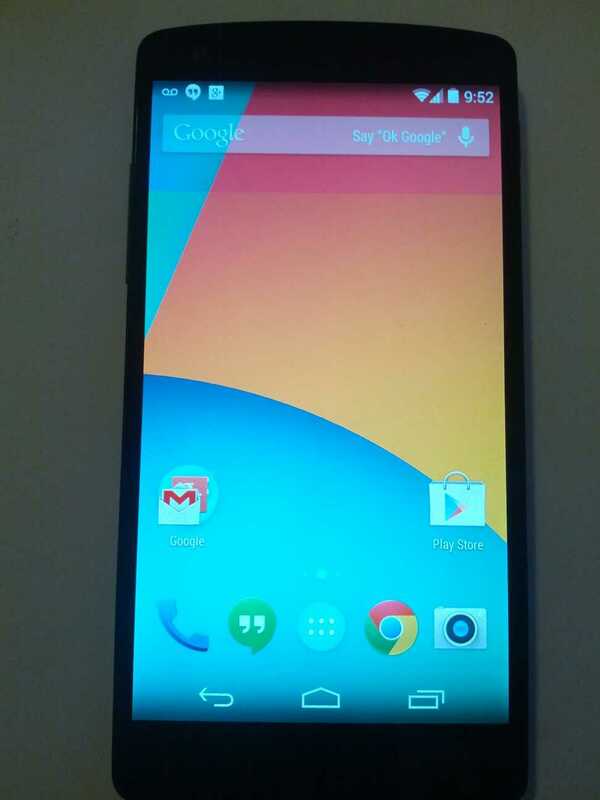 If you drag the icon entirely over another icon, KitKat will create a folder and put both icons in it. Notice that at the top of the home screen it says "X Remove". If you drag the icon over to that and release, it'll remove the icon from the home screen. Don't panic, it's still available in the All Apps if you want it back. 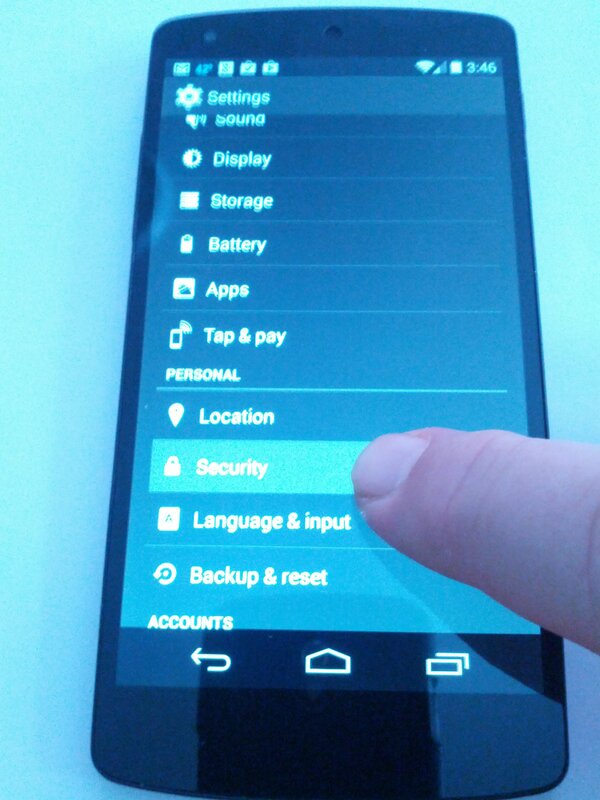 The Settings icon is also stored in the All Apps. This is important for all sorts of things. I usually make a Settings shortcut on the home screen. You do this the same way you make any home screen shortcut. Often but not always, the keyboard will have a microphone icon to activate voice recognition. Recently google made some major upgrades to the keyboard, which is now a separate app named the Google Keyboard. You can install alternative keyboard apps to get more features, but the Google Keyoard pretty useufl. The flashiest feature of the new Google Keyboard is called Gesture Typing. 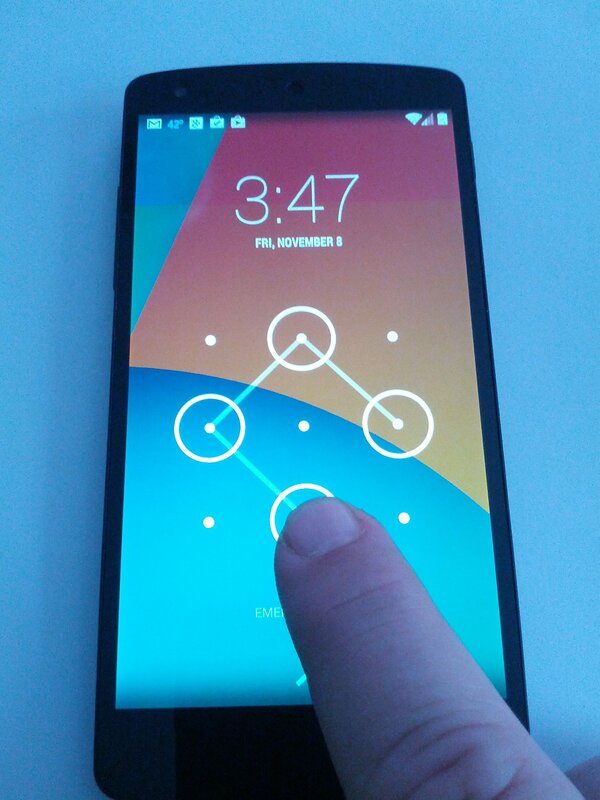 Instead of tapping individual keys, you drag your fingertip from key to key. It's faster than tapping, and by analyzing the draging motion, the keyboard makes better guesses at what you meant to type. It takes a little practice, mainly to untrain yourself from your typing habits, but it works pretty well. Also, you'll notice, as you type, that a black bar above the keyboard will list guesses as to what word you want. You can stop typing tap the correct guess to get the whole word. Even after you type, the text display will underline suspicious looking words. Tapping the underlined will bring up a list of likely alternatives. Scroll down in the settings by swiping up. 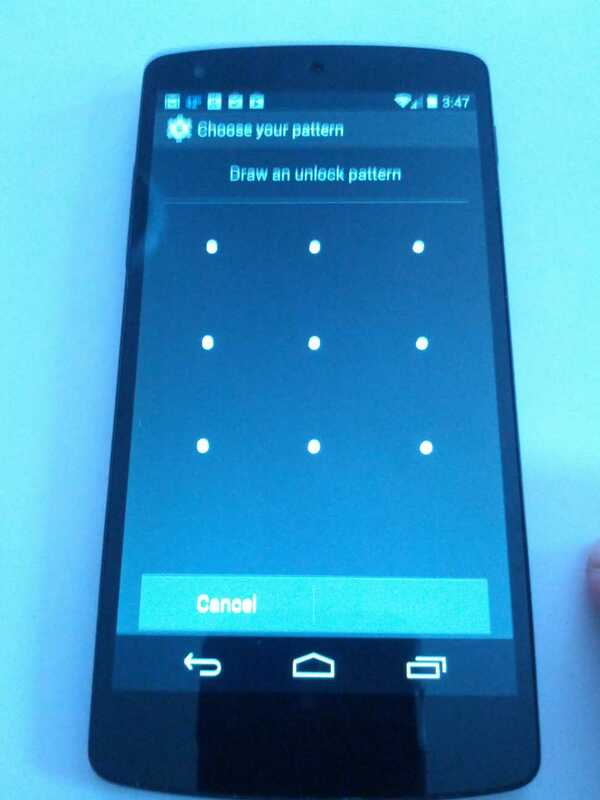 On the choose your pattern screen it presents you with a 3x3 grid of dots. Drag your finger through any pattern you like to set the pattern. It'll prompt you to repeat it, to confirm the pattern.